Everything about a cancer diagnosis is devastating for children and their families. Among the extremely difficult adjustments of battling cancer, children dread losing their hair due to chemotherapy treatments. With this in mind, a small but growing group of volunteers, led by an oncology nurse and mother, are helping keep spirits high by designing and making princess wigs for little patients. Crafted from super soft yarn, the crocheted "hair" is fashioned into the trademark, luxurious styles of beloved Disney princesses and attached to beanies, sprinkling a little fairy tale magic into an otherwise sobering time, so that kids with cancer can be a little less self-conscious about their hair loss. 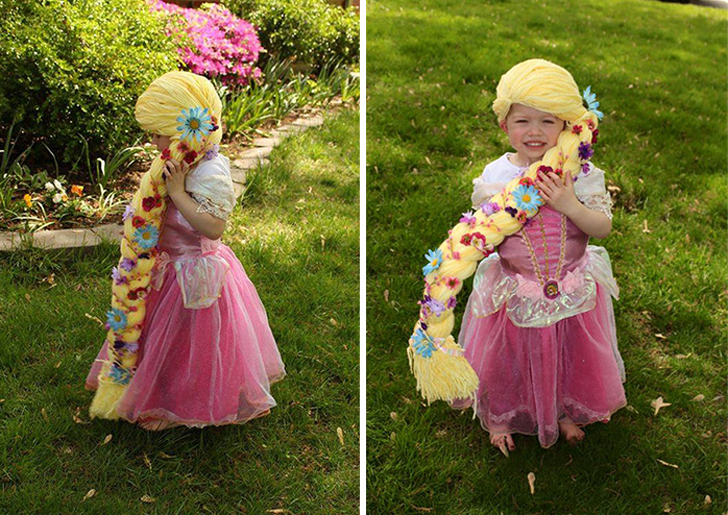 The first wig was made in a Rapunzel style with ribbons and flowers intertwined among the hair for the daughter of founder Holly Christensen’s friend soon after her cancer diagnosis. The little girl (who is now cancer-free!) loved her new wig, and the idea for The Magic Yarn Project has grown steadily ever since with continued fundraising efforts including a GoFund Me page. Although The Magic Yarn project began in Alaska, it has now shipped almost 200 wigs to 32 states and 11 countries. They have expanded their styles to Elsa, Anna, Ariel, and Rainbow, with plans to tackle the tresses of Belle and Jasmine in the near future. 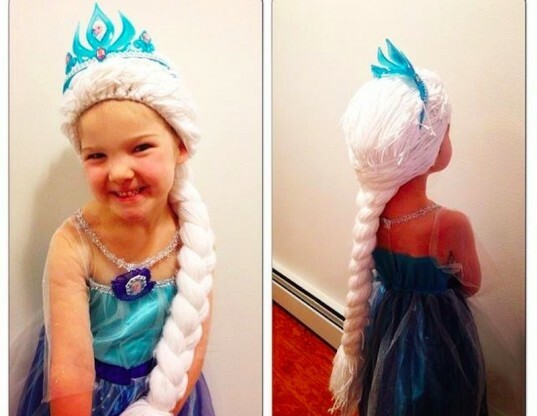 They also hope to offer more options (such as a pirate or a viking) for boys, but in the meantime, little guys can request and rock a princess wig if they’d like. Unsurprisingly and unfortunately, there is still great demand for these products, with a backlog of over 1,300 requests. The Magic Yarn Project is soliciting help and even has online wig tutorials as well as wig workshops planned around the country with the hopes that others will get involved in making life a little more magical for kids with cancer. They are also seeking yarn donations for the beanies and the “hair” since they only use particular types of soft acrylic yarn that will be gentle on sensitive, young heads. We love the idea that we can get in on The Magic Yarn action by knitting some snowflake or star accessories or crocheting a wig or by enlisting a local Girl Scouts troop to help raise money to cover The Magic Yarn Project’s shipping costs. We may even keep our newfound skills sharp year-round so that when it’s time for Halloween, we can bust out some impressive headgear as needed. In the meantime, though, our thoughts and efforts are with the thousands of cancer warriors around the globe and with The Magic Yarn Project as it works hard to keep magic, fun, and pure wonder where it belongs: in the hearts and minds of kids everywhere. The first wig was made in a Rapunzel style with ribbons and flowers intertwined among the hair for the daughter of founder Holly Christensen's friend soon after her cancer diagnosis. The little girl (who is now cancer-free!) loved her new wig, and the idea for The Magic Yarn Project has grown steadily ever since with continued fundraising efforts including a GoFund Me page. Although The Magic Yarn project began in Alaska, it has now shipped almost 200 wigs to 32 states and 11 countries. They have expanded their styles to Elsa, Anna, Ariel, and Rainbow, with plans to tackle the tresses of Belle and Jasmine in the near future. They also hope to offer more options (such as a pirate or a viking) for boys, but in the meantime, little guys can request and rock a princess wig if they'd like. Unsurprisingly and unfortunately, there is still great demand for these products, with a backlog of over 1,300 requests. The Magic Yarn Project is soliciting help and even has online wig tutorials as well as wig workshops planned around the country with the hopes that others will get involved in making life a little more magical for kids with cancer. They are also seeking yarn donations for the beanies and the "hair" since they only use particular types of soft acrylic yarn that will be gentle on sensitive, young heads. We love the idea that we can get in on the Magic Yarn action by knitting some snowflake or star accessories or crocheting a wig or by enlisting a local Girl Scouts troop to help raise money to cover the Magic Yarn Project's shipping costs. We may even keep our newfound skills sharp year-round so that when it's time for Halloween, we can bust out some impressive headgear as needed. In the meantime, though, our thoughts and efforts are with the thousands of cancer warriors around the globe and with the Magic Yarn Project as it works hard to keep magic, fun, and pure wonder where it belongs: in the hearts and minds of kids everywhere.